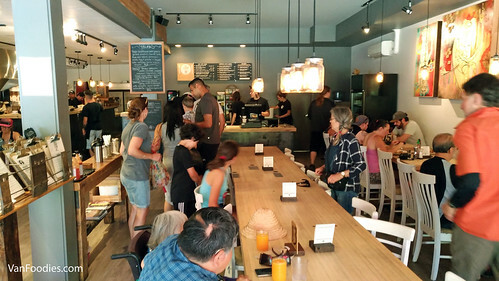 The Cannibal Cafe Downtown – Are You Bacon Bad? Because I take the Canada Line to work everyday, as I exit the Waterfront station I would see the banner sign of the Cannibal Cafe. It’s been a couple of months now and I’ve been expecting a somewhat more permanent fixture by this point. Nonetheless, when they’re selling a Groupon, I bought one to give it a try. As we sat down, the menu cover said it’s soft opening, and the menu seemed to mirror what’s at the Commercial Drive location. I guess it’s not a temporary pop-up? It was a Thursday evening and wings were on special for $5, so we ordered a pound of Cannibal Wings. They offer a few choices of flavour, and we went for the less typical Black Dragon wings. The Black Dragon is their version of a sweet & spicy sauce. I was expecting something like Thai chili sauce, but it had more heat to it. 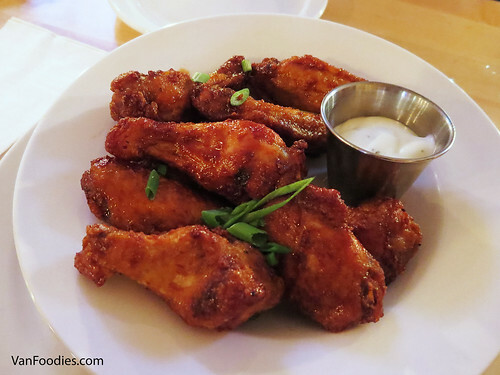 The wings were of decent size, crispy on the outside and moist inside. They weren’t heavily sauced but just enough to coat every bit of the wings. Flavours were really good. For $5 (originally $10.95), this was a very good deal. For our mains, of course we went for the burgers. I was bad; I was Bacon Bad. I mean, how can you not go for this burger?! Bacon & cheddar stuffed patty, applewood smoked bacon, Canadian cheddar, maple bacon bourbon jam, roasted garlic mayo, lettuce, onion, tomato, pickle — it has my name written all over it! The Bacon Bad burger was just as good as the description sounded. [Giveaway] Win a $25 Gift Card to Support #PiratePakDay at White Spot! For the 7th year, you will get to unleash your inner kid on Pirate Pak Day! On August 12, the popular Pirate Paks will be available to adults across BC and Alberta, and for each Pirate Pak sold on that day, White Spot will donate $2.00 to Zajac Ranch for Children, an established BC charity that provides a once-in-a-lifetime summer camp experience to kids and young adults with life-threatening illnesses and chronic disabilities. The Adult Pirate Pak offers four options: the Legendary Burger, BC Chicken Burger, Bacon Cheddar Bigger Burger and Provolone Veggie Burger. They are served in a pirate boat, and come with fries, coleslaw, a soft drink, a scoop of ice cream and a chocolate “gold coin”. I have been a fan of this charity initiative, and have been crazy enough to wait 1.5 hour to grab a Pirate Pak. If you have never participated before, now is your chance! I’m giving away a $25 gift card to White Spot so you can bring a date with you on Pirate Pak Day! Last weekend we checked out the Columbia StrEAT in New Westminster, featuring more than 50 food trucks from the Lower Mainland. 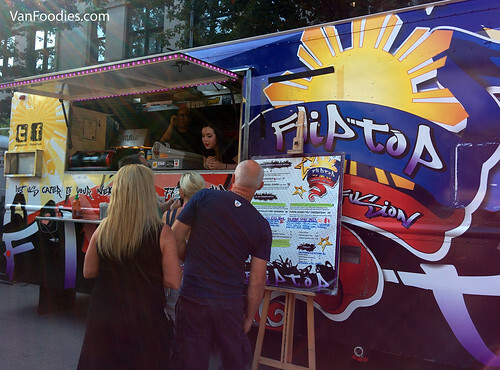 We tried a few trucks, including Fliptop Filipino Fusion. This food truck is usually in the Fairview area during the week, not in my ‘hood, so I was quite excited about the opportunity to try them. Suggested by the truck name, their menu is a fusion of North American favourites with Filipino flavours. You would find pulled pork sandwich, philly cheesesteak, sliders and tacos with a Filipino twist. Two things caught my eyes. 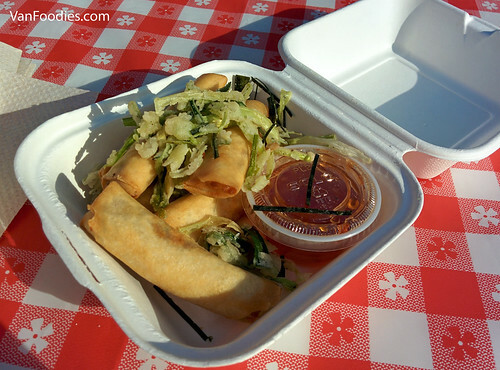 First, Lumpiang Shanghai is the meat version of Lumpia, which are deep fried spring rolls in rice roll wrappers. These mini spring rolls were perfect for sharing, and they tasted awesome! I would’ve preferred just a bit more soy or seasoning in the meat, but I liked that there was a lot of meat in the filling, no fillers! Spring rolls were crispy, and we really enjoyed the sprinkle of nori (seaweed) and fried leeks on top. The dipping sauce reminded me of Thai chili sauce, but thinner and more acidic. $7 for 6 of these springs rolls was a pretty good deal.